The sport was introduced to the Olympics in 1900, but was dropped in 1920 due to a lack of uniformity in rules and equipment among nations. 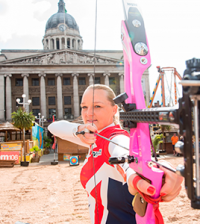 However a long-awaited international code allowed archery to make its return in 1972 and has been a part of the Games ever since. Good concentration, balance and eyesight are key elements to do well at the sport, with the need for an exceptionally steady hand and decent equipment. Anchor: Point on the archer’s face where the drawing hand contacts and locks in at full draw. Fish-tailing: Visible swerve in an arrow’s flight. Limb: The working part of a bow. Nock: A groove in the arrow or bow that engages the string. Robin Hood: Splitting an arrow lengthwise by firing another arrow into it. Skirt: The non-scoring area of the target. Athletes stand 70 metres from their target and score points by firing arrows at ten concentric scoring zones, from the golden ‘bullseye’ ten-score at the centre to the one-score on the white outer ring. They have 40 seconds to release each arrow. In the individual and team competitions, a preliminary round to determine seeding takes place before the official start of the London 2012 Games, consisting of 72 arrows. The seedings are used to determine who plays who in the head-to-head elimination rounds. 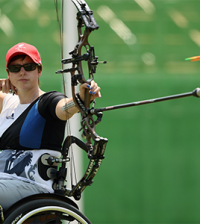 In the individual competition, 64 archers compete in a knock-out format, with matches comprising 12 arrows each. Alison Williamson leads the way in the British women’s rankings. 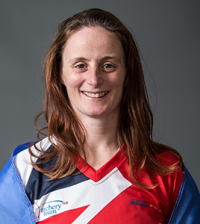 She has represented Great Britain at five Olympic Games, from 1992-2008, (her best winning bronze in Athens in 2004), 2012 in London will be her sixth. Olympic rivalry? Korea (North and South) dominate Olympic archery, having won five medals in four events in Beijing. The South Korean women have won individual and team gold medals (eleven in total) in every Olympic event they have entered since 1984. Who’s the gold medal favourite? Ok-Hee Yun of South Korea – she won two medals at Beijing (gold in the team event and bronze in the individual). Hollywood actress Geena Davis took part in US trials for the Sydney 2000 Olympic team, she came 24th in the competition, failing to make the final team, but gave the sport a lot of publicity in the meantime.